Who better to spy on government installations but a shark with a camera on its head? It's not outlandish in the world of GI Joe! Revenge of the Spy Shark (7413) provides some great fun for fans, although like the rest of the 1975-76 line it is largely a repackaging of older accessories. Hardest to find is the black shark, made from the same mold as the one in Danger of the Depths. 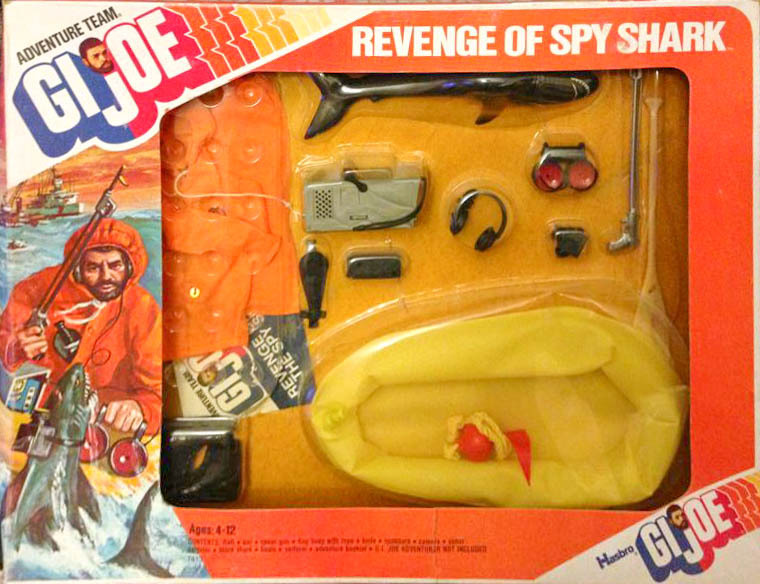 The set also contains a unique yellow raft with on markings or oar loops, an unpainted spear gun, a magnetic flaw detector (now a sonar unit), a buoy with a plain red flag, a camera, oar, a knife and sheath, and an orange outfit in the same design as that from Secret Rendezvous.